ate something lovely to listen to. gifts and make their magic in front of and behind the micrphone." soaring and strong vocals striking memories of Sarah Vaughn or Carmen McRae." wonderful intonation, and stage presence. The sky is her limit." A major test of any new recording is whether it avoids a “been there, done that” sound. Sonny and Perley’s third release, Let It Happen, consistently escapes this trap, with three numbers (“Estate,” “Scarborough Fair” and “Hymne l'Amour”) particularly illustrating this fact. “Estate” (”Summer”), which has become a contemporary standard favored by many jazz and Brazilian vocalists, serves as a test of Perley Rousseau’s ability to distinctively interpret even familiar material. Her heartfelt reading of both the English and Italian lyrics almost redefines poignancy. Sonny Daye’s spare electric keyboards, the throbbing bass lines of pianist Bill Charlap’s talented brother Tom, and the delicate flute of Charlie Tokarz, all engagingly accented and colored by the various percussion instruments of Brian Melick, set the exotic atmosphere the song calls for. This number also strikes a successful balance between extending a song long enough to allow an engaging groove to be played out, but not so long the listener loses interest. The ability to personalize a song is even better illustrated with “Scarborough Fair.” Their arrangement of this old English folk tune is markedly different than Simon and Garfunkel’s and includes the touching medieval prose, delivered in an alternating tender and commanding fashion by Ms. Rousseau. Likewise, the ability to sustain musical and emotional appeal over an extended time is again demonstrated in the effectively dramatic way the song slowly builds to a spellbinding resolution over nine minutes. Lastly, “Hymne a l'Amour”, which is usually sung in this country in English, merits special mention. Ms. Rousseau sings an appropriately heartbreaking rendition (including the original French lyrics) of this as “Hymne a l’Amour” (”Hymn of Love”), written by renowned French singer Edith Piaf--her grieving tribute to her lost love, boxer Marcel Cerdan, whose plane crashed on his way to see her. The nexus of art and emotion are joined in an exceptional way in this material. Melodic, rhythmic and sensual represent frequent descriptions of the very special married team of keyboardist Sonny Daye and vocalist Perley Rousseau, one of the most popular and exciting musical attractions in the Capitol District. They engagingly perform the timeless standards of the great American songbook composers like Irving Berlin and the Gershwins, compelling jazz classics by legends like Charlie Parker and John Coltrane as well as irresistible Brazilian melodies by Antonio Carlos Jobim and Ivan Lins, among others. Perleys beautifully rich voice, with the emotional power, swing and improvisational feel of a true jazz singer, also enunciates English lyrics with bell like clarity and Portuguese lyrics with an authenticity that leads Brazilians hearing their CDs to mistake her for a native. She does all this with a captivating effervescence and saucy stage presence, effectively accented by an intriguing assortment of exotic instruments. Sonnys very facile, slightly percussive keyboard work and appealing arrangements are also key components of their crowd pleasing presentation. Depending on the venue, they sometimes also utilize the extraordinary percussionist Brian Melick, with his dozens of fascinating instruments, or an excellent compliment of musicians on bass, drums and saxophone to create an even fuller array of possible dynamics, colors and shadings. Their website, www.sonnyandperley.com, provides a good deal more information, including their two CDs, Love Dance and East of the Sun. The piano/vocal duo of Sonny & Perley is one of a handful of jazz acts that can say with confidence they are working steadily. A look at the itinerary of the Albany-based pair reveals an average of about 200 dates per year, an impressive number for most regional acts, jazz or otherwise. There are a few practical reasons why these musical soulmates work so much. For one, the duo format allows them the flexibility to take weekday one-nighters, traveling light and keeping the price right. Another is that, in addition to being a fine pianist, Sonny maintains a second career in the booking business as "Sonny Daye, Inc." --- it helps when you know how to get the gigs. The main reason the couple plays out so much, however, becomes evident upon hearing East of the Sun: They deliver the goods. Perley Rousseau is a stylish and expressive vocalist whose eclectic repertoire runs from Songbook favorites to the more modern Braziliana of Milton Nascimento and Antonio Carlos Jobim. Her interpretations of the Jobim book are especially impressive: she avoids falling into the breathy, now-clichéd Astrud Gilberto style, opting instead for a fuller open style of her own. A major strength is her ballad singing, demonstrated here in a poignant rendition of the Billie Holiday vehicle, Detour Ahead, which is done in a bolero style. The multi-instrumentalist Daye, who also plays drums professionally, is a lyrical, percussive player unafraid to improvise freely---often a challenge for the duo accompanist. For East of the Sun, the couple employs the trio of guitarist John Hilton, electric bassist Tommy Ford, and drummer Mike DeMarco. 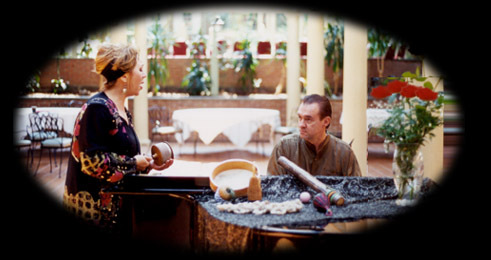 Hilton and company, also from the Albany area, are a good match for Sonny and Perleys music, as theyre equally at home with the Latin grooves and straight-ahead jazz material. Burlington jazz fans have probably already noticed that Luenigs is a regular stop for Sonny & Perley. They played there several evenings this fall and will be back after the start of the new year. Its a mixture of jazz and Brazilian music. Better yet, its called bossa nova, a rhythmic style that embodies Brazilian jazz, and Albany musicians Perley Rousseau and Sonny Daye have spent most of their lives fascinated by its unique sound. "Once we started, we just wanted to do more and more Brazilian; it whetted our appetite," Daye said in a recent interview with the Glens Falls Post Star. Rousseau sums up their fascination with bossa nova in one word---saudade [pronounced saw-dajee]. Theres no literal English translation, but the closest thing is a tremendous state of longing, during which one can be happy and sad at the same time. Thats the essence of bossa nova that makes it so compelling. Compelling is a fitting word to describe their latest CD, East of the Sun. Recently released, it offers a wonderful insight into the worlds of jazz and bossa nova. Inspired by the likes of jazz greats Ella Fitzgerald, Sarah Vaughn and Carmen McCrea, songs such as Nothing Will Be As It Was and The Nearness of You resound with their influence. Rousseaus vocals combine the best of Fitzgerald, Vaughn and McCrea while adding a flair totally her own. Dedicated to their newfound musical love, Rousseau has taken lessons in Portuguese, mastering the intonation and pronunciation of lyrics she uses in her musical repertoire. East of the Sun boasts two such songs, Molambo, and A Felicidade. Though the meaning of the lyrics is lost to those unschooled in the Portuguese language, the sentiment and saudade are clear. A wonderful example of jazz and bossa nova at its finest, East of the Sun is a must for those interested in jazz, Brazilian or a CD that will carry the listener on a journey to far away lands. Released last December, East of the Sun was recorded at SUNY Tunes in Albany and features refreshing new arrangements of jazz standards such as Charlie Parkers Billies Bounce, John Coltranes Naima and Irving Berlins Cheek to Cheek. There are a few Brazilian selections too---with lyrics in Portuguese---which seem to be a carry-over from their last album, Love Dance. Throw in some cabaret, a few love ballads, and some bossa nova and samba, and youve got a virtual cornucopia of hip tunes that will make you want to get cozy one minute and shake your can the next. Rousseau and Daye are joined on this recording by another group of groovers who are also quite adept at doing the Brazilian thing. The John Hilton Trio performs with Hilton on guitar, Tommy Ford on bass and Mike DeMarco on drums. The project seems effortless. Rousseaus voice is like vanilla pudding. Her vocal training was mostly classical, as she studied six years with an international opera singer who she describes as both strict and encouraging. She later [briefly studied] jazz singing and scatting from artist Sheila Jordan and from listening carefully to other jazz vocalists. "I grew up listening to all of the jazz greats," says Rousseau, "in particular Carmen McCrea, Ella, of course, and Sarah Vaughn. I was also exposed to the more smooth sounds of bossa nova when Sergio Mendez and Brazil 66, Astrud Gilberto, And Antonio Carlos Jobim invaded the U.S. in the early 60's. Then I met some lovely Brazilian people who started tutoring me in Portuguese." Daye is a creative and versatile jazz pianist. Interesting, since hes only been playing the piano for seven years. His musical training began with the drums; he played them in his younger years and in high school bands. Daye later moved on to study music in college, but jazz was always his real love. "I thank God every day that I can go to work and do what I love," says Rousseau. Its a big risk, to do what you love. We wanted to become full time musicians and it was quite a jump. But we just left everything behind, knowing that this was what we were created to do. And when you take that leap, you are sustained. Its a kind of faith."